-‘More people should be asking why John Kerry installed two former aides, both with ZERO foreign policy experience, into top posts at State,’ he also wrote. The man that was fired from his White House job for making anonymous attacks on administration officials on Twitter may now be investigated for possibly hiring prostitutes. Jofi Joseph was fired on Tuesday after he was unmasked as the man behind the @NatSecWonk account that had captivated so much of D.C. by taking shots at politicians and hinting of his exclusive knowledge. Now investigators Joseph, who is married, may be connected to another anonymous account that frequently made mentions of hiring prostitutes. While Joseph has come forward and put out a statement apologizing for the ‘inappropriate and mean-spirited comments’ that he made via @NatSecWonk, he made no mention of any connection to the second account, called @DCHobbyist. That account has now been shut following the swarm of attention, but Foreign Policy reports that it directed a number of tweets at self-identified escorts. At one point, @DCHobbyist wrote about Toronto’s ‘tsunami of gorgeous and sensual escorts’. 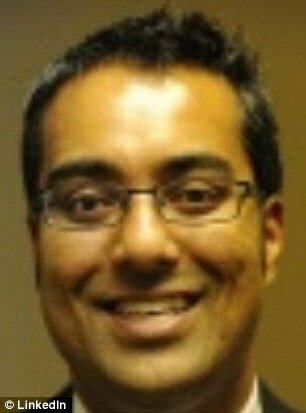 If the two accounts are connected, Joseph may face legal problems regarding his alleged use of prostitutes. Not only is solicitation a crime, but there are political concerns as well since Joseph’s wife is a well-respected advisor on the Senate Foreign Relations Committee. Aside from the moral repercussions of cheating, there is inevitably concern about the prospect of being blackmailed for information or access, based either on his now-former role as a non-proliferation director on the National Security Council or his wife Carolyn Leddy’s role in the Senate. After first refusing to comment to Politico’s Glenn Thrush about the scandal when it first broke on Wednesday, saying that it would ‘affect his ability to get a new job,’ he followed up with a formal statement. ‘It has been a privilege to serve in this Administration and I deeply regret violating the trust and confidence placed in me,’ he said in the statement. 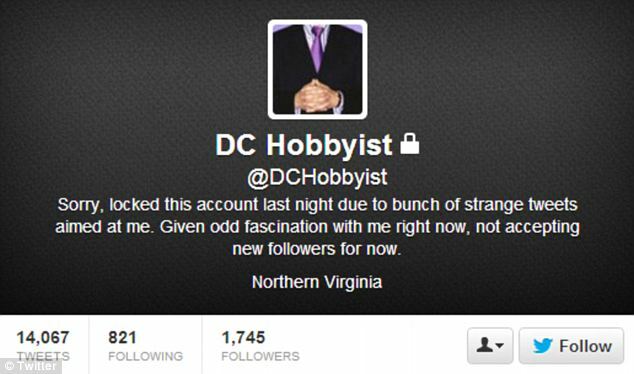 He went on to explain that it ‘started out as an intended parody account of DC culture’. Those comments included insults hurled at Republicans and Democrats alike. 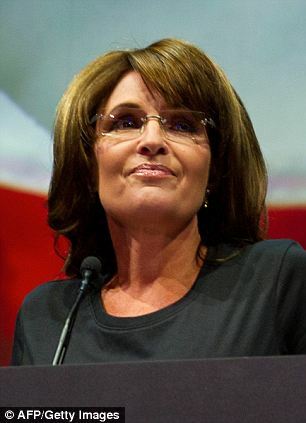 ‘So when will someone do us the favor of getting rid of Sarah Palin and the rest of her white trash family? What utter useless garbage,’ he tweeted last October about the former Republican Vice Presidential nominee. Before Anthony Weiner’s first trouble with Twitter that ended his Congressional career, and before Samantha Powers was appointed as the American ambassador to the United Nations, he took aim at their love choices. ‘Was Huma Abedin wearing beer goggles the night she met Anthony Wiener? 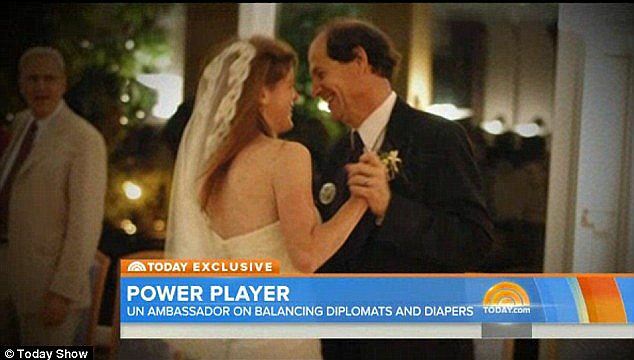 Almost as bad a pairing as Samantha Powers and Cass Sunstein,’ @NatSecWonk tweeted in 2011. There were serious comments about political connections as well- rather than petty personal jabs. 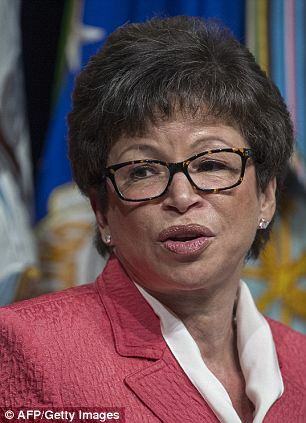 ‘I’m a fan of Obama, but his continuing reliance and dependence upon a vacuous cipher like Valerie Jarrett concerns me,’ he said of the President’s longtime friend and advisor. ‘More people should be asking why John Kerry installed two former aides, both with ZERO foreign policy experience, into top posts at State,’ he also wrote.